Quick Setting Cement Grout is a quick setting cement and mortar supplied in dry powder form. Quick Setting Cement Grout constitutes a blend of cement grades and chemical set control agents. The product needs only onsite addition of required amount of water just before the use of Quick Setting Cement Grout. Our Quick Setting Cement Grout is very useful for plugging. 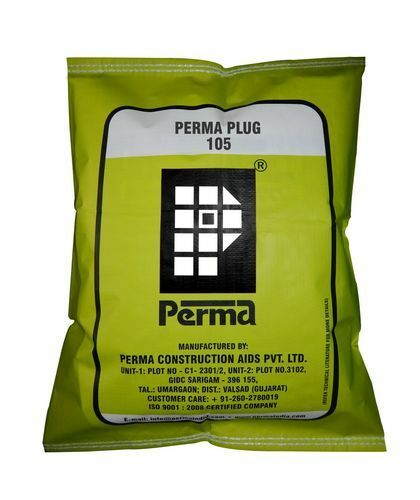 Heavy Duty Plugging : Quick Setting Cement Grout is suitable for plugging of pre-stressing/post tensioning holes or depressions in the pipes, sleepers or girders. Repairs of Buildings : Repairs to corners and edges of high strength concrete structures and general repairs in the building industry. Plugging Running Leaks : Quick Setting Cement Grout is used to stop leaks from water tanks and leaky basements because of its quick setting property. Sealing Joints : Quick Setting Cement Grout can be effectively used for filling joints, pointing brick stone masonry and water proofing. Easy to Use : Quick Setting Cement Grout is supplied in powder form. It only needs addition of water before use. Rapid Setting : "Rapid setting property of this product makes it useful in stopping running water. High strength : Quick Setting Cement Grout hardens to a high strength, which is comparable to the strength of the member under repair in hours only. Compatibility : Quick Setting Cement Grout is highly compatible for use with all cementitious materials, stone, brick, steel etc. Clean the surface to be treated as per normal surface preparation, methods for concrete removing, loose particles, deleterious materials etc. Mix Quick Setting Cement Grout and water in the proportion of 3 volumes of powder to 1volume of water and mix to obtain a stiff consistency paste. Press in position or trowel the paste to the finishing level and cure normally. Health And Safety : Quick Setting Cement Grout is generally nontoxic. But it is advised that workers use gloves and avoid contact with skin. Accidental splashes of the powder on skin or eyes should be immediately washed with plenty of clean water. In the event of prolonged irritation seek medical advice. Packing : Quick Setting Cement Grout is available in1 kg, 10 kgs and 25 kgs packing. Shelf Life : Quick Setting Cement Grout should be stored in a cool dry condition away from moisture. Unopened packs have a shelf life of 12 months.